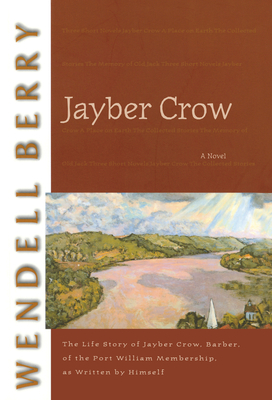 "This is a book about Heaven," says Jayber Crow, "but I must say too that . . . I have wondered sometimes if it would not finally turn out to be a book about Hell." It is 1932 and he has returned to his native Port William to become the town's barber. Orphaned at age ten, Jayber Crow's acquaintance with loneliness and want have made him a patient observer of the human animal, in both its goodness and frailty. He began his search as a "pre-ministerial student" at Pigeonville College. There, freedom met with new burdens and a young man needed more than a mirror to find himself. But the beginning of that finding was a short conversation with "Old Grit," his profound professor of New Testament Greek. "You have been given questions to which you cannot be given answers. You will have to live them out--perhaps a little at a time." "And how long is that going to take?" "I don't know. As long as you live, perhaps." "That could be a long time." "I will tell you a further mystery," he said. "It may take longer." Wendell Berry's clear-sighted depiction of humanity's gifts--love and loss, joy and despair--is seen though his intimate knowledge of the Port William Membership. Wendell Berry is the author of fifty books of poetry, fiction, and essays. He was recently awarded the Cleanth Brooks Medal for Lifetime Achievement by the Fellowship of Southern Writers and the Louis Bromfield Society Award. For over forty years he has lived and farmed with his wife, Tanya, in Kentucky.